How often do you toss out produce that isn’t super fresh anymore? It feels as if it should still be ok to eat. You just aren’t sure what to do with it. I am a zealous farmers market shopper and frequently find myself scrambling to find recipes for produce before it goes bad. Slightly soft tomatoes would be grossly soggy on a sandwich. Instead turn then into a rich burger topping when you make Roasted Garlic Ketchup. 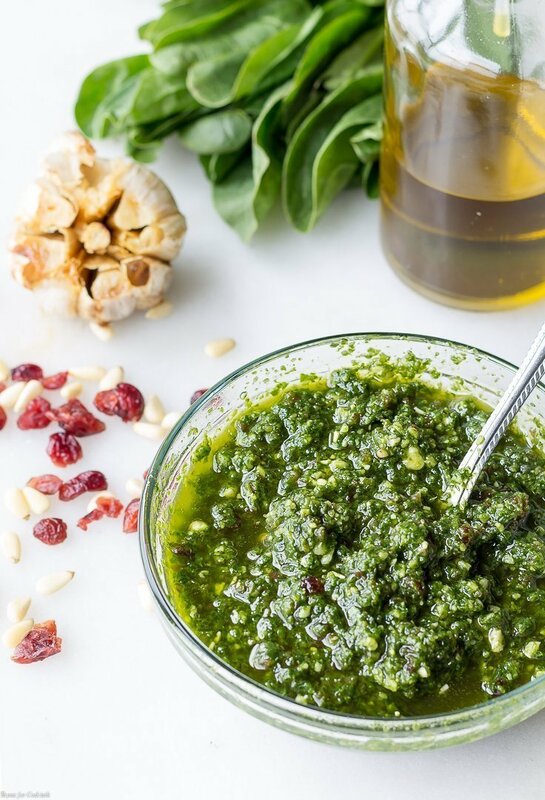 Slightly wilted greens greens like arugula, baby kale, and spinach are transformed into fragrant pesto. I keep to the basics of classic pesto. Some form of garlic is a must. Plus a little splash of something acidic and whatever nuts are in the freezer. Cheese is optional but encouraged. 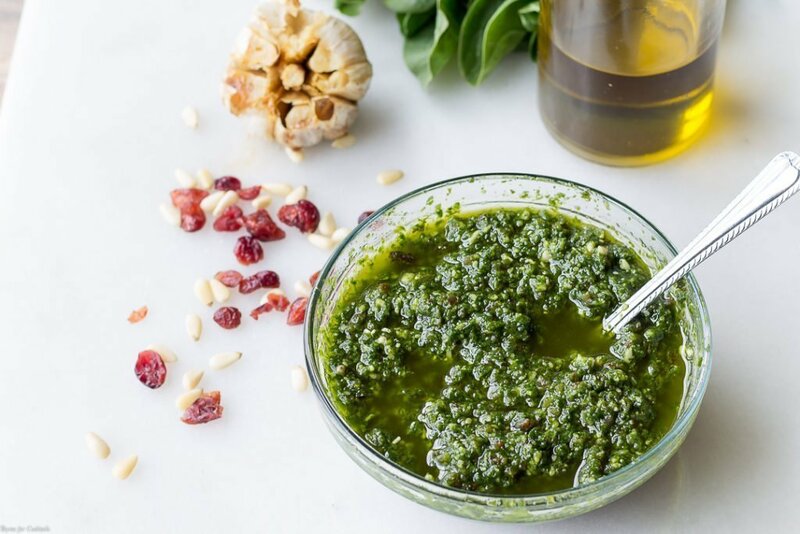 After that I like to mix things up like in this Spinach Cranberry Pesto recipe. I love dried cranberry sprinkled over a fresh spinach salad. So adding them to a pesto recipe didn’t seem too far fetched. Roasted garlic has been the star in my kitchen lately. There was plenty involved when I made my Easy Roast Chicken Quarters recently in order to update the recipe photos. Anytime I bake a savory dish a few bulbs end up in the oven. Might as well right! I also like to add more oil than some recipes call for. You can drain the excess off once the pesto has rested in the fridge overnight. Use it in a vinaigrette or marinade for subtle freshness! What Kitchen Hacks do you have to save produce that is almost to it’s expiration point? 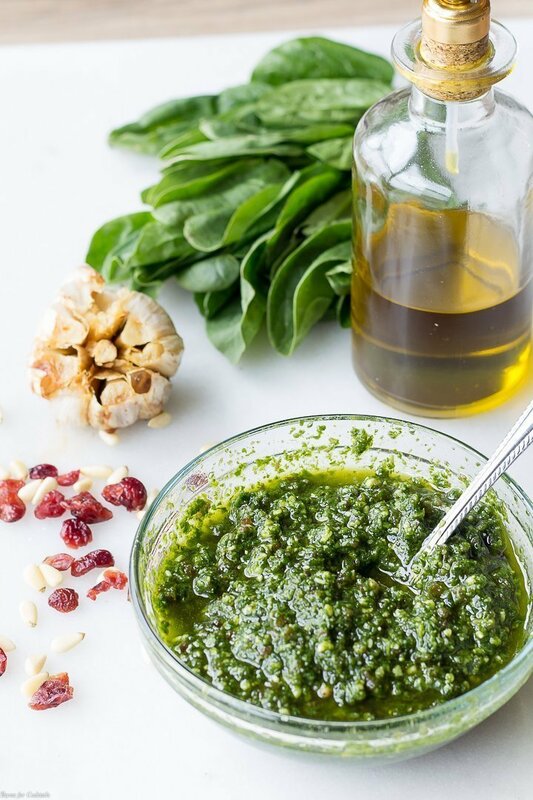 I hope you like this Spinach Cranberry Pesto recipe as much as my crew does. 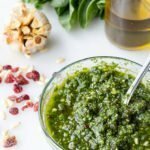 If you love this easy seasonal recipe, you can find more like it by checking out my other pesto recipes! For daily recipe inspiration, subscribe to my newsletter, follow me on Instagram, and for generally inappropriate humor follow like me on Facebook! Add all ingredients except oil to a food processor. Run on low until well blended, approximately 30 seconds. Drizzle in oil while food processor is still running until pesto is smooth. Add pesto to a lidded jar. Drizzle more oil over the top if desired. Store closed in the refrigerator for up to two weeks. After 1-2 days drain off excess oil for use in vinaigrettes or marinades.